When you talk about glory days or musical scenes that were influential to me, there are few that have been as impactful as the mid-late 90's punk rock scene in the UK. Based around Crackle records, this first batch of Leatherface and Snuff influenced bands blew my mind when I was younger. This crew of bands like Broccoli, Chopper, Hooton 3 Car, Crocodile God, Travis Cut and Skimmer jumped out at me like few bands have before or since. That Skimmer is still putting out records all these years later is a wonderful thing to me. This was another album picked up while in Japan. I have to admit that I haven't kept up on Skimmer quite as much as I once did. They fell off my radar a bit and I didn't realize this album had come out. 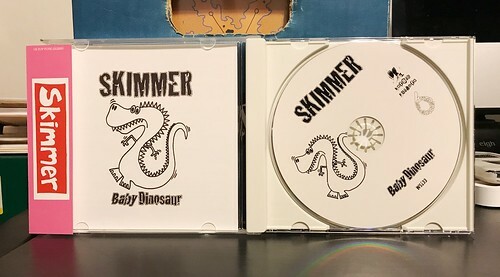 I'm happy to report Skimmer is as great as they've always been and their new songs are every bit as good as the ones they put out in those aforementioned glory days. It's tough for me to describe Skimmer by comparing them to other bands as they are often the band I would compare others too. I suppose there's certainly a slice of Mega City Four and Senseless Things buried in there as Skimmer has a way with melody very reminiscent of those bands, but Skimmer has a full bore fuzzed our guitar attack guiding them through their songs. They're soul mates with Japanese bands like Navel, but still have elements that are wholly unique to them. Chances are if you've listened to Skimmer in the past and enjoyed them, this record will be right up your alley. If you've never heard them before, this is album is as good an album as any to start with. Oh, their singles compilations Compitoenail should be next on your list.